“On The Ropes” Boxing Radio returns this week with host Jenna J to breakdown all the latest fights and fight news in boxing. In this episode I will be recapping Saturday night’s SHOWTIME tripleheader which saw Bernard Hopkins unify the light heavyweight title by defeating Beibut Shumenov. Also on the card, Shawn Porter and Peter Quillin picked up important wins for their careers. I will discuss the future of all three of the winners and the importance these wins mean to their respective careers. Also on this show, I will be previewing the upcoming Showtime event that is set to take place this Saturday night at the StubHub Center in Carson, California. The card is headlined by interim WBA Welterweight champion, Keith ‘One Time’ Thurman, as he takes on veteran Julio Diaz. In the co main event of the night, Lucas ‘La Máquina’ Matthysse will face off with the hard hitting John Molina, in a fight that will surely not go the distance. Lastly I will discuss the Wladimir Klitschko vs. Alex Laepai match, as they fight for the IBO/WBO/WBA Heavyweight titles. Just click on the audio player to listen to the show! The first guest on this show is Peter ‘Kid Chocolate’ Quillin. Peter discusses his latest win against Lukas Konecny, and talks about his future going forward. Quillin also talks about the possibility of facing off against Gennady Golovkin sometime in the future, and if he believes Floyd Mayweather would ever consider fighting him. Lastly, Peter Quillin gives his thoughts on Manny Pacquiao’s win over Bradley, and Mayweather vs. Maidana. The second guest is rising American heavyweight, Bryant Jennings. Making his debut appearance to the show, Bryant talks about his emergence in the sport and discusses his next scheduled bout with Mike Perez, and if he feels like Perez is still a top level fighter. Additionally, Jennings talks about his goals of becoming a heavyweight champion, and gives his views on the top stars in boxing today. The third guest is undefeated super middleweight contender, Brandon ‘Flawless’ Gonzales. Brandon returns to the show to talk about his upcoming bout in the UK against James DeGale on May 31st, and if he feels that he is at a disadvantage by fighting in DeGale’s home country. Brandon also gives his views on the rest of the division and if he feels his shot at the super middleweight crown is overdue. The main guest is boxing legend and current HBO analyst, Roy Jones Jr, who comes on to discuss the recent Manny Pacquiao vs Timothy Bradley fight and gives his opinions on Pacquiao’s future. Roy also breaks down Bernard Hopkins’ last win and talks about possibly having a rubber match with Hopkins. Lastly, Jones Jr. talks about his own career and what he hopes to accomplish now this stage. 4 Responses to "Roy Jones Jr on Pacquiao vs. Marquez 5 & career. Peter Quillin on win & Mayweather bout. 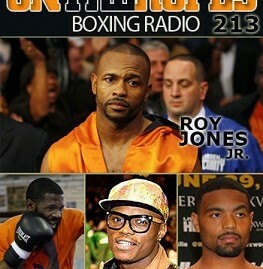 Also with Bryant Jennings & Brandon Gonzales – On The Ropes # 213"
….i love rOy jones, he has contributed so much to the sport of bOxing, i will always take my hat for him because he is trully a legEnd. I think as a legend he shOuld advice the scared floyd to fight manny pAcquiao, well flOyd is not a legend because he’s the only one claiming that he’s the best ever without facing the best challenges, legendary athletes surpass the greatest obstacles to their careers, as for me pacquiao is too much for floyd in and outside the ring! Anyone who knows boxing shall advise Mayweather to fights Pacquiao. Mayweather defense will not work on lefty specially if Pacman will punch with his signature left offense and succeeded with 4 to 10 combination. Mayweather knows it already and his fans should demand him to fight Pacman. Are you implying that Floyd has never fought a lefty? Hah dude get real.